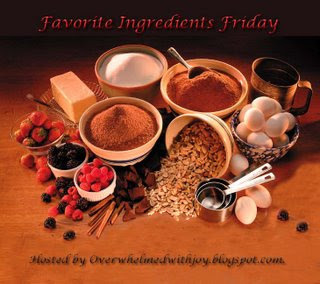 It's been a long time since I've participated in the Favorite Ingredients Friday, shame on me. Things get so busy around here and I tend to forget these weekly features.....so I apologize to the wonderful lady at "Overwhelmed with Joy". 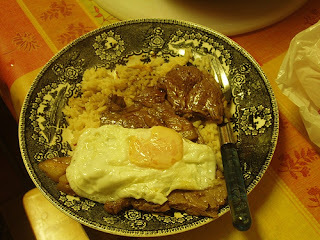 For today I'm sharing my Portuguese Steaks, they can be served 2 ways....you can either serve them for dinner with some homemade fries (the way I make them more often), or you can serve them as a sandwich in some fresh french rolls which is called a Bifana (I do this for a quick lunch or light dinner). 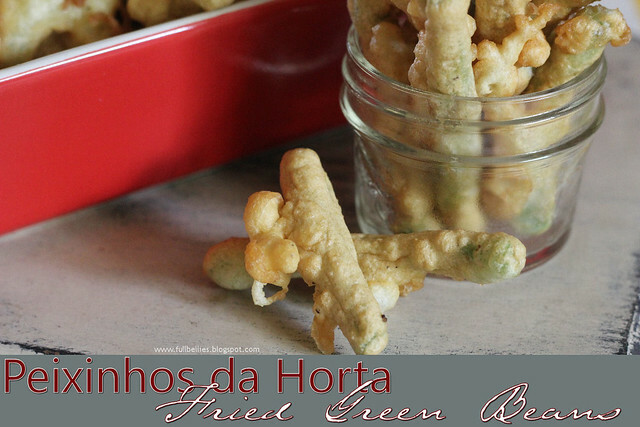 My kids love green beans so the first time I served them this popular portuguese side dish, they couldn't get enough, they literally devoured these faster than I could fry them. Enjoy! The literal translation of the title of this dish is "little fish from the garden." The name comes from the fact that once the beans are cooked, they resemble a tangle of slender fried fish that are popular in Portugal. 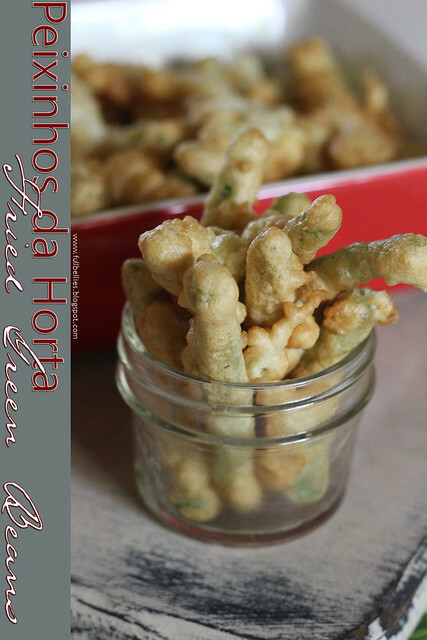 Serve them as a side dish, a starter,or even a snack. Now because I just eyeball things and I've been making these since I was oh, about 14 years old or so, I don't have exact amounts so I am sharing a version of the recipe from Leite's Culinaria. 1. Cook the beans in a large pot of boiling salted water until crisp-tender, about 2 minutes. Drain, cool in a bowl of ice water, and drain again. 2. Heat the oil in a deep fryer or a large saucepan over medium-high heat to 350°F (175°C). 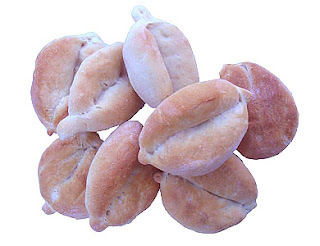 Combine the flour, water, eggs, baking powder, salt and pepper in a large bowl; whisk until a smooth batter forms. 3. Dip six beans at a time into the batter, shaking off any excess. Add the beans to the hot oil and fry until golden brown, about 4 minutes per batch. Using a slotted spoon, transfer the beans to paper towels to drain. Sprinkle with more salt and serve hot. 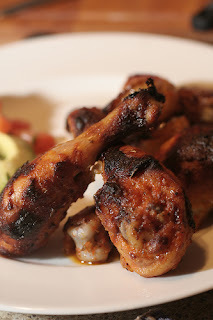 Here's the Portuguese Chicken Piri Piri recipe, it requires lots of marinading time but is well worth the wait. I usually just marinate it the day before and let it sit in the refrigerator until the next day. YUMMY! 1. In large glass bowl, combine all ingredients except chicken; mix well. 2. Add chicken, turning to coat. 3. Cover and refrigerate for 4 hours, turning occasionally; can be refrigerated for up to 24 hours if you want to make it ahead. 4. Reserving marinade, place chicken, skin side down, on a greased grill over medium heat; close lid and cook for 10 minutes. 5. Turn and brush with marinade; cook for 30 to 40 minutes or until juices run clear when chicken is pierced. 6. For a less spicy version, replace above marinade with Portuguese Paprika Marinade: 1/3 cup dry white wine, 1 tsp grated lemon rind, 3 tbsp lemon juice, 2 tbsp tomato paste, 1 tbsp olive oil, 1/2 tsp paprika, 1/4 tsp salt, 1/4 tsp hot pepper sauce, and 2 cloves of garlic, minced. For dinner tonight I made this lasagna, I honestly can't remember where I found it at, but I know it was online. It's not MINE so credit goes to whoever it belongs to. *Cooks note: this amount of filling makes enough for 3 recipes. If you are only making this recipe, the extra sauce can be frozen for up to 3 months. Heat the oil in a large stock pot over medium heat. Add onion and garlic and saute 3 minutes, until soft. Add, beef and cook 5 to 7 minutes, until browned all over, breaking up the meat as it cooks. Stir in basil, oregano and red pepper flakes. Add diced tomatoes and tomato sauce and bring to a simmer. Reduce heat to low and simmer 10 to 15 minutes. Remove from heat and set aside. Meanwhile, in a large bowl, combine ricotta, half of the mozzarella, egg, and black pepper. Mix well. Pour 1 cup of the meat sauce in the bottom of a 13 by 9-inch lasagna pan. 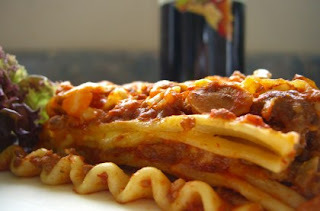 Arrange 4 UNCOOKED lasagna noodles on top of sauce, overlapping noodles slightly to cover the bottom. Spoon half of the cheese mixture over noodles. Top with 1 1/2 cups of meat sauce and 4 more noodles. Top second layer of noodles with remaining cheese mixture, 1 1/2 cups of meat sauce and 4 more noodles. Top noodles with 1 1/2 cups of meat sauce and remaining mozzarella cheese. Top with Parmesan cheese. Refrigerate or freeze the remaining sauce. Cover with foil and bake 45 minutes. Uncover and bake 15 more minutes, until top is golden and bubbly. Let stand 5 minutes before slicing. Blogger Awards Nomination and a Recipe!!! So I woke up this morning to a great surprise, the wonderful Mrs L had nominated this blog for the Blogger Choice Awards Best Food Blog. WOW!!! 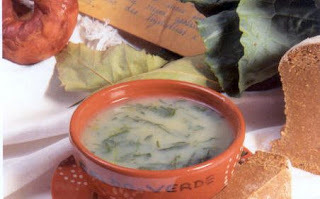 If there is ONE soup that I absolutely love it's Caldo Verde and ask any portuguese person about it, I can bet you they all know it well. It's one of my favorite soups and one that reminds me of home and especially my greatgrandmother, she made the BEST Caldo Verde. Enjoy!! !